Youth is fleeting. Youth is fickle. Youth doesn’t stick around for anyone. Youth is, well, it’s cavalier. And You Me At Six captured that perfectly. Cavalier Youth not only rings with a more optimistic tone than any of the British band’s previous releases, it feels like a cohesive album telling a story. Listeners will find themselves on an exploration of the different emotions of youth and growing up, from uplifting enthusiasm, to questioning defiance and finally a hope for what’s still to come. The quintet’s fourth studio album opens with ‘Too Young To Feel This Old,’ which sounds as if it were the song embodiment of the album artwork itself. As a complete 180 from the darker and harder sound of Sinners Never Sleep, it sets the tone for the rest of the release. It’s so anthemic, in fact, that it wouldn’t shock us one bit if it becomes a fan favorite, especially during live shows. ‘Fresh Start Fever’ and ‘Forgive and Forget’ shortly follow the opening track and feel almost like the different emotions caused by the same event. The former is much more uptempo, more frenzied and more motivated, proclaiming that “the brave die young and that’s all right for some” but that they’re “after something long term” so they’re going to “make resolutions” for a fresh start. The latter feels like the release, and the solution to ‘Fresh Start Fever.’ It’s the come down and singer Josh Franceschi laments, asking if “we can forgive and forget, if only for the weekend.” Whether it was intentional placement on their part, ‘Fresh Start Fever’ and ‘Forgive and Forget’ fit to perfectly together, it would be remiss of us to not note that listening to them in any other order would not have the same effect. Cavalier Youth ends with a feeling of self realization and hope. ‘Wild Ones’ may very well be the standout track of the album as it looks towards the future and encourages listeners to live for the now. It’s uplifting, and bookends the rest of the release perfectly with the opening. 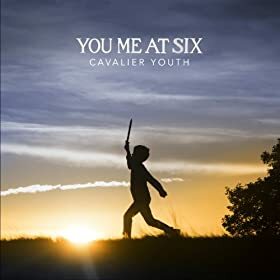 What’s most notable about Cavalier Youth is how You Me At Six managed to create such a unified sounding album, and yet give each track its own life. This is a new, much more mature You Me At Six, and we quite enjoy the chance to see such growth from the fivesome. It isn’t a perfect release, there are a couple of songs that feel a little bit like fillers-- ‘Room To Breathe’ and ‘Win Some, Lose Some’-- but it is a great release, and the band has set themselves up for even better things to come. Cavalier Youth is out January 28th via Prospect Park Records.